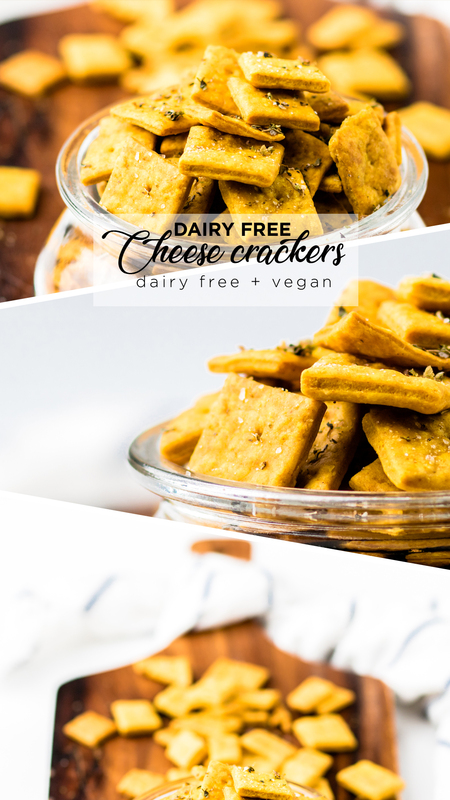 Dairy free cheese crackers are the perfect dairy free snacks! Throw them the lunchbox or just a fun anytime snack! 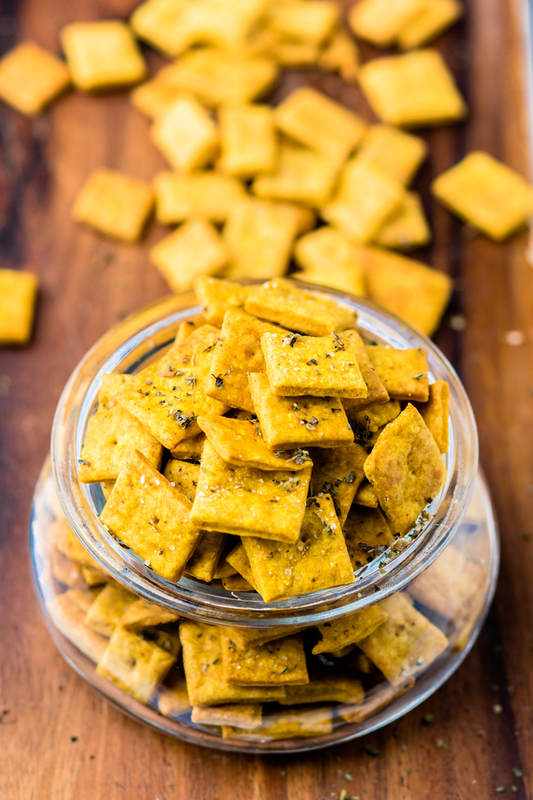 If you are looking for a dairy free alternative to Cheez-It crackers, we have you covered. 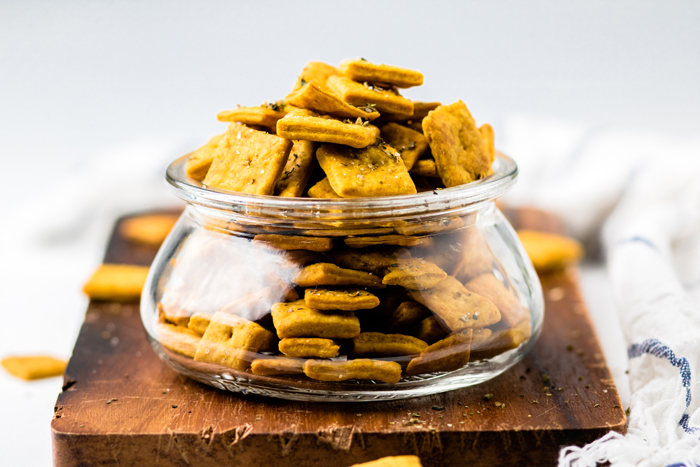 These vegan cheese crackers are relatively easy to make following the recipe below. They can be seasoned or not in a variety of ways. 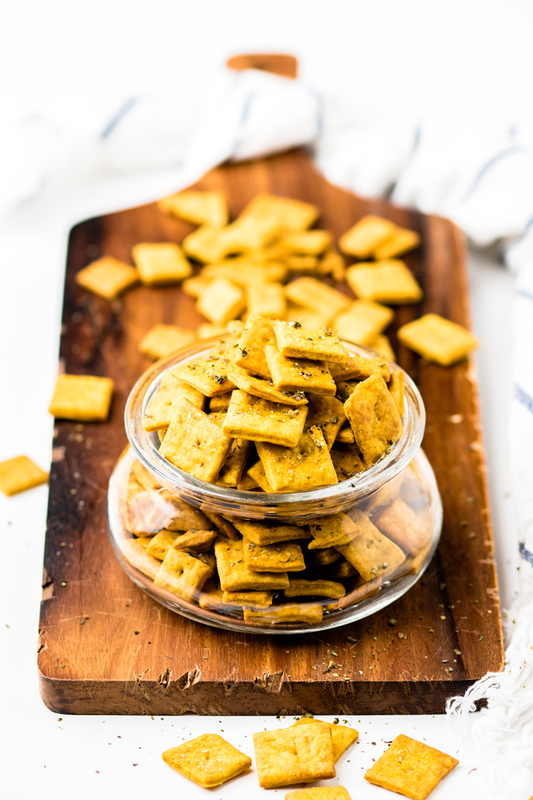 These bite size dairy free snacks pack the perfect taste for moments you are craving something salty and/or crunchy! What are the ingredients in dairy free cheese crackers? 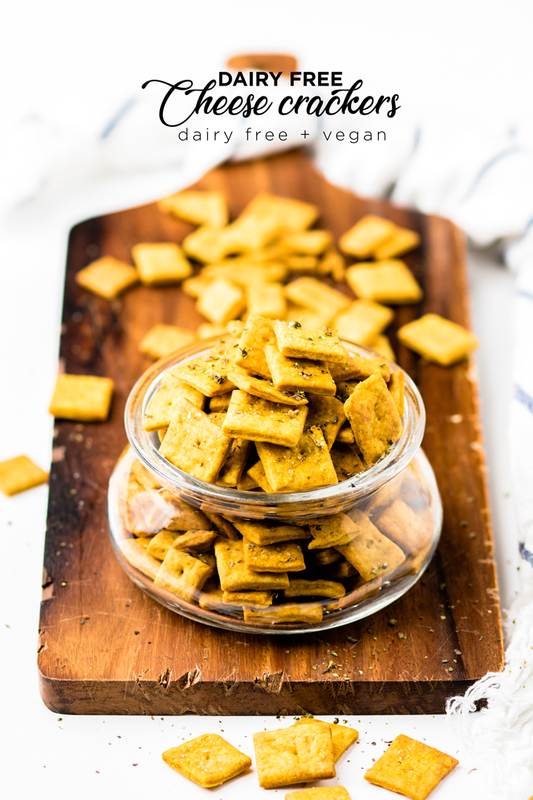 How do you make dairy free cheese crackers? If you are looking for a vegan Cheez-It alternative, I have it right here for you. Full below and ingredients amounts are below. After preheating the oven, you combine flour, nutritional yeast, baking powder, salt, garlic powder, turmeric, and paprika together. Once that is mixed, you add in vegan butter, and lemon juice. Using a fork, mash together the dough until it’s fine and crumbly. Then, add water in small amounts until the dough forms a ball and becomes cohesive. After you have a ball of dough formed, transfer between two larger pieces of parchment paper. The parchment paper should be the same size at the baking sheet that you are using. Additionally, a silpat could be used to make this dairy free cookie recipe. With the dough between the parchment papers, roll until thin. Once rolled out to roughly 11×13, use a pizza cutter to cut dough to 1-2 inch squares. Using a skewer, make a hole in the middle of each cracker. 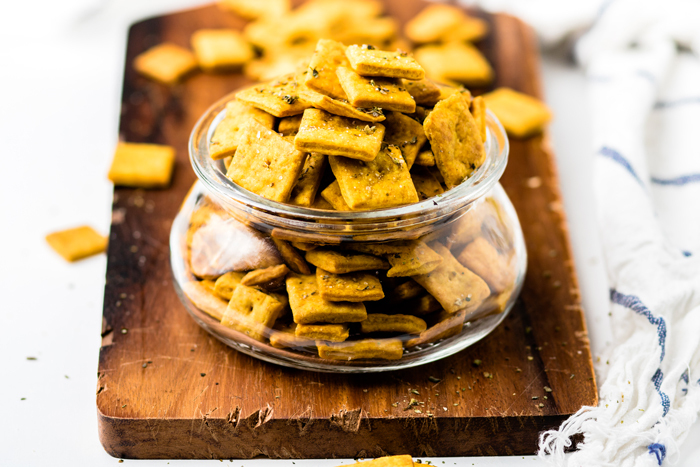 Spray the cut crackers with olive oil spray and then top with course salt and dried Italian seasoning. Cook the crackers to golden brown and make a crunchy snap when broken. Nutritional yeast is a nutty, cheesy flavored ingredient that is usually available for purchase in flake form. It’s derived from a yeast called Saccaharomyces cerevisiae. Once harvested, it is deactivated via heating, meaning that it won’t froth up like other yeasts you may have used for baking in the past. You can find nutritional yeast in any natural health store, bulk buy store or purchase online. In a bowl, combine flour, nutritional yeast, baking powder, garlic powder, salt, paprika, and turmeric. Mix using a fork until combined. Add in the vegan butter, olive oil, and lemon juice. Mix again, using fork, until the dough and crumbly (about the consistency of a crumb topping). Add the water a tablespoon at a time, mixing after each time until the dough is cohesive and forms a balls. *Could use your hands during this process if it helps. Tear two pieces of parchment paper, large enough to fit a baking sheet. Place dough ball in between the two pieces of parchment paper. Remove top sheet of parchment paper and discard. Use a pizza cutter make lines 1-2 inches apart vertically. And then repeat horizontally. Using the small end of a skewer (wooden or metal), drive a small hole into the center of each cracker. Place pachment paper with crackers onto baking sheet and spread out so they are not touching. *Crackers can be very close to each other but should have space to not be touching. Top with course salt and Italian seasoning evenly. Remove and let cool. Keep in a sealed container. **The outer edge pieces after cutting the rectangle are not going to be even squares. You can leave as is and just have a few odd shaped pieces; or, you can ball back together, roll out again, and re cut to get more exact squares. **When baking, the outer four sides of the baking sheet will cook fast. 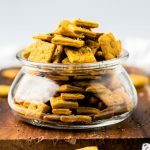 Check the crackers at 18 minutes and if the outer edges are golden brown, remove these crackers carefully and then continue cooking middle crackers for a few additional minutes. **Feel free to switch up flavor combinations like taco seasoning, rosemary, cajun spice blend, and more.